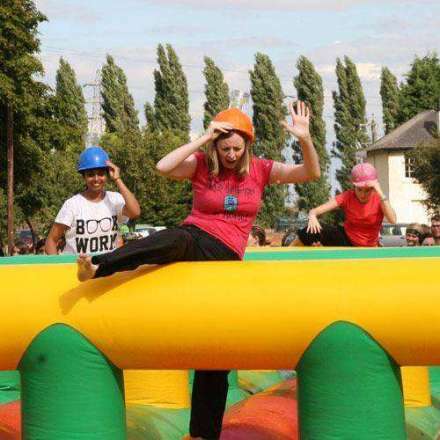 Join us for an afternoon of frolicking fun at our first ever It's A Knockout! 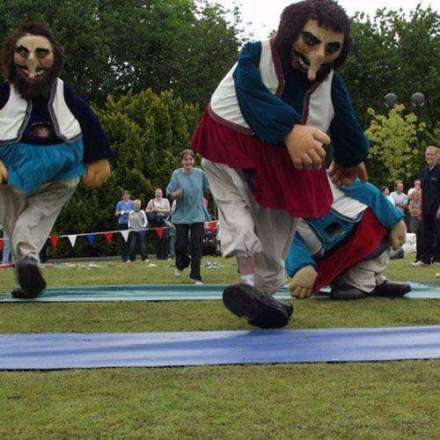 "In this frantic event, participants climb inside a 10ft Giant costume complete with giant shoes and quite simply run across the crazy carpets operated by the opposing teams. The giant's progress is hampered by the fact that the carpets are moving backwards and forwards making it difficult to stay on their feet! The first giant back full dressed and on their feet win maximum points!" 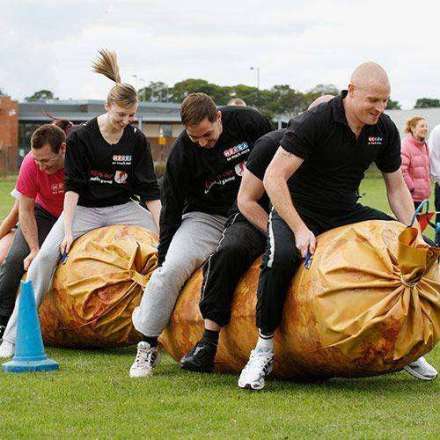 "Teams must mount the giant inflatable sausage links, make their way through the slalom and be the first to make it out of the frying pan! A full team game that requires coordination and timing, it's not as easy as it seems! With plenty of hilarity and a good dose of team spirit, teams must try to make sausage meat out of the opposition." "This game consists of a giant inflatable hurdle course. The whole team compete across the course wearing a hat containing a cup full of water. The more water they keep in the cup the more points the team get. Once everyone has completed the course the team with the most water wins!" "Because there "ain't no mountain high enough" we have an inflatable substitute! In an attempt to recreate Hannibal's exploits, you'll be required to make as many climbs of this mountain with the aid of the rope. Sounds easy, until you see the soap and water! 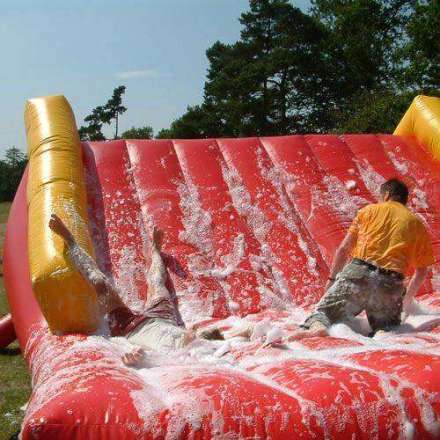 A game that will require as many of your team members to make as many trips over the inflatable in the allotted time." 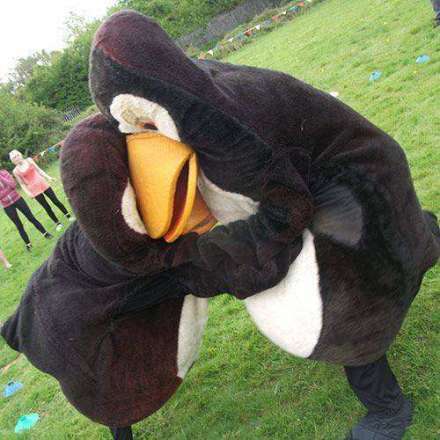 "On the whistle, the penguins run anticlockwise around a course. All each penguin has to do is catch the penguin in front to eliminate them from the heat.The remaining penguins must enter the ring of ice, for a penguin sumo to the death." "The whole team form a human chain standing on pedestals – when the compere says Start - the anchor person collects the sponges from the large bucket of water and passes them down the line. 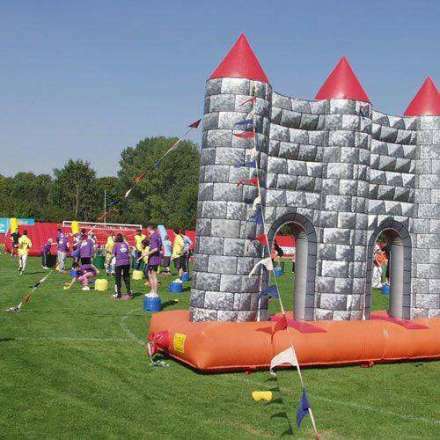 The last person in the team must catapult wet sponges over the castle wall to their team mate who will squeeze all the remaining water into a container. At the conclusion of the event, the measuring stick comes out and the team with the most water wins!!!" The winning team gets a bottle of champagne, and there's also medals for first second and third place! Give your team a cool name, and if you feel like it a theme or colour to dress up in! Now, time for the 'serious' stuff. Each team must have a minimum of seven and maximum of 10 participants. Tickets are available for teams of seven, eight, nine and ten, The full team is to be paid for at time of purchase - we wouldn't want anyone missing out! There will be a medic onsite for any accidents and we will have a burger van on site on the day for you to purchase food from.